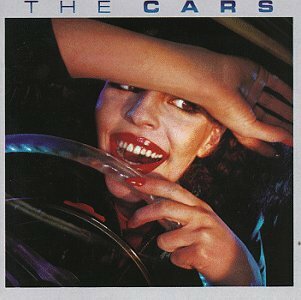 The Cars eponymous debut album has always been one of my favorites, even though I discovered it years after it had been released. 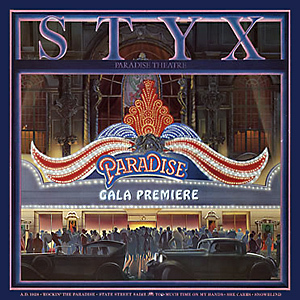 It’s one of those albums that when you listen to it, you forget how many of the songs were hits and how good they all are: “Good Times Roll,” “My Best Friend’s Girl,” “Just What I Needed,” “You’re All I’ve Got Tonight,” “Bye Bye Love.” In my opinion it stands as one of the best debut albums in rock and roll, along with Boston, Appetite for Destruction and Pearl Jam’s Ten. Here’s the whole song on YouTube — the solo starts at 1:58. I picked this solo for two reasons. First, it’s got a completely different style and sound than the other solos I’ve been working on — a Chet Atkins twang-a-billy sound that George Harrison ripped off in the Beatle’s “I Will,” and which was lifted again by Elliot Easton for this song. It’s just a great, different and difficult solo, which makes it perfect for this project. Second, I have a good story to go with it. I went to see the Cars in concert in 1983 as a Junior in High School. They played at Austin’s Southpark Meadows Outdoor Amphitheater, which was basically a large open pasture with a stage at one end and a 10-foot high wooden fence around it. It is now a gigantic strip-mall. I could wax nostalgic about the loss of one of Austin’s landmark music venues, but the truth is that it really wasn’t a great venue. I went to three shows there and don’t really remember enjoying any of them. It’s probably more entertaining as a mega retail center, with ten or twelve restaurants and a theater. Regarding the concert, well, there’s no way to sugar coat this… the Cars sucked in concert. If you want proof, check out this YouTube video. Not only were they pretty lifeless on stage, the sound mixing was awful and their vocal harmonies were not on key. All in all it would have been a very unmemorable night, except for who I went to the concert with. I went with my best friend Andy Hartsock and his girlfriend at the time, Kathy. She, coincidentally, had been briefly, and very recently, my girlfriend. So I got to experience the full frontal irony of listening to the Cars playing “My Best Friend’s Girl” with my best friend and his girl, who in truth used to be mine. And the Cars sucked, which was like salt in the wound. Andy and Kathy broke up shortly after that, and she and I got back together and stayed together for about three years, so although I remember being hurt and lonely at the concert, it all worked out. And Andy is still my best friend. Here’s a picture of Easton’s signature Gretsch hollow-body guitar. It’s got those two twangy humbuckers and a very distinctive sound. I don’t have access to a Gretsch, so I’m borrowing a Fender Telecaster from my buddy Dave (thanks Dave! ), which is the kind of guitar Elliot recorded the song on in the first place. Backing Track: Sorry, there isn’t a good backing track for this song available. I had to scrounge it together from several sources and make my own. If you want a copy, send me an email. In the early ’80s, much of the music that I consumed came through the television. MTV was a revelation and a revolution, and me and my friends could not get enough of it. We all lamented their long, slow slide from a music video channel, to something else, something less, something unworthy of their initials. 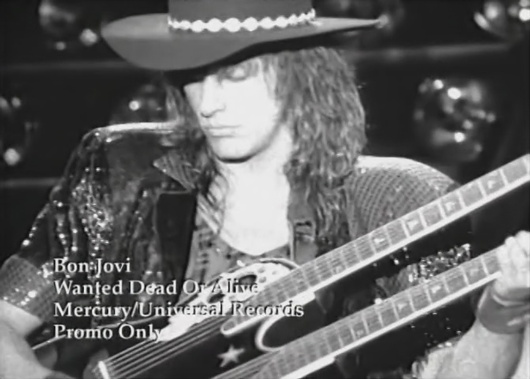 I think no other video defines that era for me than Bon Jovi’s stylistic, black & white, band-on-the-road video for Wanted Dead or Alive. The incredible irony of the video is that the song lamented the trials and loneliness of life on the road for a megaband, while at the same time made me as a teenage boy yearn for that lifestyle. As an adult, I think of how incredibly whiny the sentiment is — poor Bon Jovi and his international success. How hard that must have been. But as a kid, I accepted it without cynicism. Yeah, it’s hard and lonely on the road, but it’s worth it to see a million faces and rock them all. 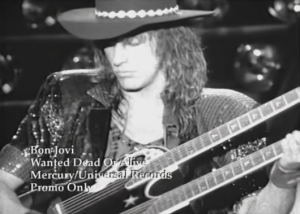 If Jon Bon Jovi is the driving force behind the song, then Ritchie Sambora is the linchpin that holds it all together. His ethereal and melodic 12-string riffs give the song its backbone, and his unexpected and raunchy solo that acts as the turning point to the song. Finally, he’s the voice behind the unforgettable one-word backing vocal, the soulful “Waaaan-ted!” that no one can resist singing along with. 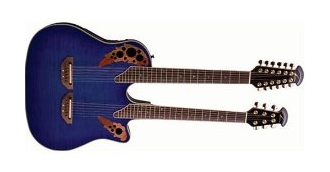 In the video and on tour, Ritchie plays this iconic dual-neck Ovation. His solo is filled with what are known as “pinch harmonics” or “squealies” — they give the solo it’s hard edge and reckless feel, and they are not easy to create. The technique involves hitting the string with your thumb at the same time as the pick, causing a harmonic tone. I admit that I’m not very good or consistent at it, and that’s the one thing that might cause this solo to take longer than usual. We’ll see if I can get better quickly. My wife and I generally don’t do big Christmas gifts for each other. We think of Christmas as mostly for the kids and would rather spend our money on them than on each other. We always manage to come up with something small and meaningful to exchange on Christmas morning, but rarely are they the kind of “oh wow!” presents that my wife gave me this year. To me the perfect gift has three elements. First, it needs to be a surprise. My wife has a wish list on Amazon and generally I get her something from her list, which ensures that she’ll like it, but it kind of removes the sense of unexpectedness. The gift she got me this year was very much a surprise — I knew it had something to do with my solos project because she asked me for a list of the songs and albums six weeks ago, but I had no idea what she was going to do with that information. Second, the gift needs to require effort. Most gifts require merely traveling to a store, or more likely in these times, to a web site. A little wrapping and you’re done. The best gifts are those that are hand-made, need significant work to assemble, or require trips to multiple stores. Angie’s gift to me this year involved all three. That doesn’t even include the effort it took to keep the whole thing hidden from me — using her parent’s credit card, having things delivered to friends’ houses. Finally, the gift needs to be meaningful. When people talk about getting bad gifts, often they mean that the present didn’t have any meaning. The giver didn’t choose something that reflected the recipient’s personality — a favorite color, hobby or style. The gift that my wife gave me had meaning on multiple levels. First it related to my project that is a central focus for me right now. It also drew upon my love for vinyl records, specifically the large beautiful cover art. And it involved the very albums that are my favorites for the very reasons I chose them for this project. 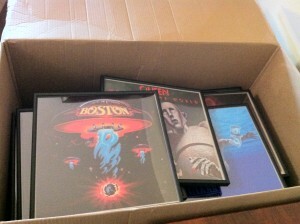 The perfect gift that Angie gave me was framed album art for all of the solos that I’m doing for this project. She went out and bought some used albums, and found high-resolution artwork for those that she couldn’t find and had them printed. Twenty-four framed albums in all (not 25 because two of the songs are from the same album). It was an amazing surprise that took a lot of effort and was extremely thoughtful. I can’t express how that makes me feel.